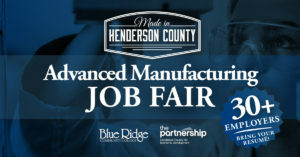 Hendersonville, N.C. – Blue Ridge Community College and Henderson County Partnership for Economic Development will host the Made in Henderson County Advanced Manufacturing Job Fair on Monday, April 30 from 12:30 p.m. to 6 p.m. in the Blue Ridge Conference Hall, located at 49 East Campus Drive in Flat Rock. More than 30 manufacturing companies will attend the event and are hiring for both production and non-production jobs. Interested job seekers should come with their resume and be prepared to discuss job opportunities. To learn more, visit hendersoncounty.jobs. Henderson County Partnership for Economic Development is a public/private partnership that serves as the professional economic development organization for Henderson County. 2018 marks 24 years of an organized economic development effort resulting in $1.23 billion of taxable investment, helping to create and retain 5,583 jobs. To learn more, visit www.gohendersoncountync.org. Blue Ridge Community College is a two-year, comprehensive post-secondary institution located in the mountains of Western North Carolina. It serves Henderson and Transylvania counties. Chartered in 1969, the College is one of 58 public institutions within the North Carolina Community College System. It operates under the leadership of a president and a 15-member board of trustees. The mission of the College is to provide quality education and training opportunities that support student learning, enhance student advancement and success, and meet the workforce needs of the community. BRCC offers more than 100 programs of study; awards associate degrees, diplomas, and certificates; offers a wide range of college transfer courses; has articulation programs with four-year colleges and universities; and provides one of the largest continuing education programs in the state. Students who graduate from BRCC are eligible to transfer to any of North Carolina’s 18 public colleges and universities. Many students take advantage of scholarships offered through the College’s Educational Foundation or receive assistance from grants and loans. BRCC maintains an extensive lineup of technical programs designed to prepare students for successful careers in nursing, automotive technology, law enforcement, emergency response, engineering technology, machining technology, and many others. To learn more, visit http://www.blueridge.edu/.